The McKenna bible after restoration. Growing up, I remember having two huge old family bibles in the house. They were in terrible condition with detached covers, loose pages, and other damage. My mother said they had been that way since she was a teenager. The bibles had been missing for some time but finally resurfaced a couple of years ago. I was able to find a book restorer who did an amazing job repairing the family heirlooms. Both bibles were published in the late 1800s and had been kept by my great-grandmother, Helen (McKenna) Dickinson, who died when I was in college. One bible was clearly owned by Helen’s in-laws, John and Carrie (Luke) Dickinson. It contains birth, marriage and death records of both the Dickinsons and the Lukes. We have never found an indication in the second bible of who the original owners were, but suspected that it belonged to Helen’s parents, Cornelius and Susan (DuRoss) McKenna. I finally decided to search more carefully through the bible for clues, thinking that there might be something handwritten on a page or on something inserted between pages. I started going through the 500-page bible one page at a time. 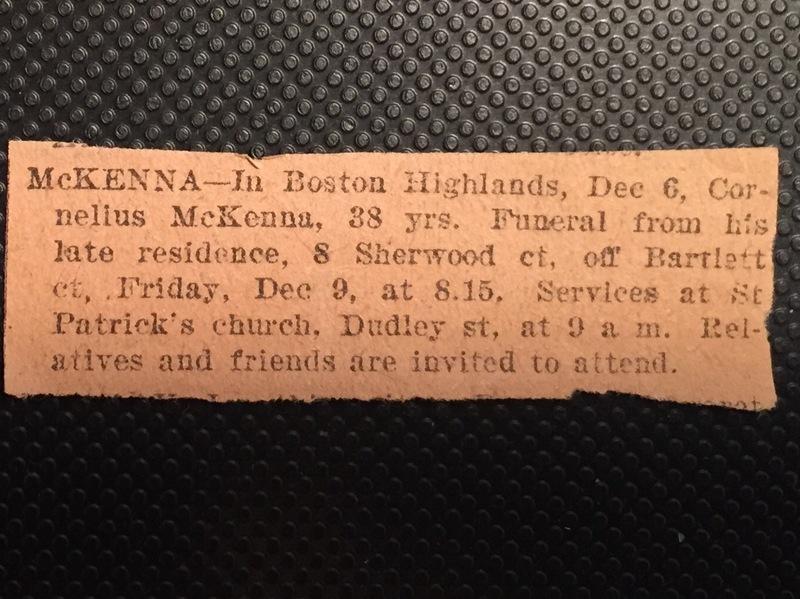 Incredibly, tucked deep between the pages, I found a tiny 117-year-old newspaper clipping. 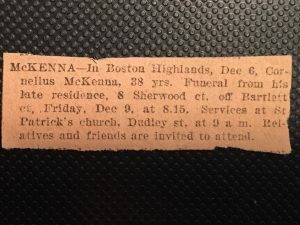 It was only about a half-inch wide and two inches long, but it was the death notice of my great-great-grandfather, Cornelius McKenna, who died on 6 December 1898. After finding the death notice, I reassessed what I knew. Cornelius and Susan were Catholic, and this is a Catholic bible. (The Dickinsons were not Catholic, so neither was the other bible.) Susan and Cornelius were married in 1882. The bible was published in 1884. Having found Cornelius’ death notice between the pages, I now believe that this bible did, indeed, belong to Susan and Cornelius McKenna. And it makes sense that Helen would have kept together the bible of her parents and that of her husband’s parents. 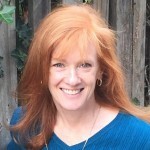 Knowing the tragedies that befell Susan McKenna in her lifetime, I can only imagine that she must have turned to the bible often for comfort. In the ten years after Susan and Cornelius were married, they had six children. However, between 1887 and 1894 they lost four of the six, all to different diseases. Then in 1898 Cornelius died of typhoid fever, leaving Susan widowed with 14-year-old Helen, my great-grandmother, and 7-year-old Edmund. In addition, Susan’s own father, an Irish immigrant, died when she was 4 years old after being struck by lightning. She also had four siblings, none of whom survived past age 24. Happily, Susan and her two surviving children lived long lives. Susan died in 1937 at age 79. Edmund lived to be 89 years old, and Helen passed away in 1982 just one day before her 98th birthday. Given everything I’ve learned in researching Susan’s life, it is a real privilege to have her bible in my home and to have been able to restore it. Thanks for this story! I’m often amazed by our ancestors’ perseverance, given the fragility of life (even today). It’s a privilege to examine and record lives like Susan’s, isn’t it? 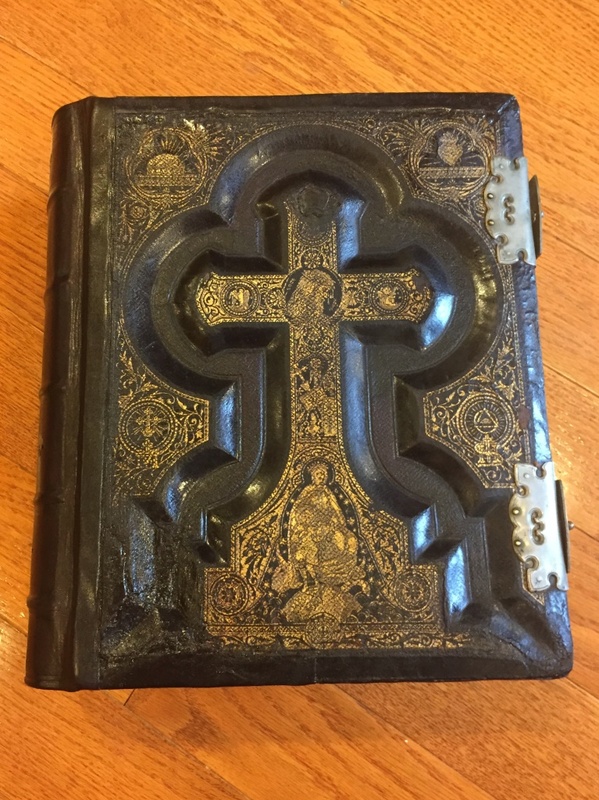 Wonderful to have the old family Bible and part of your family’s history – and it pays to peruse old books carefully! Does anyone have tips for finding a family Bible? Somewhere around the early 2000s, someone posted (on a message board at Ancestry) that they had the Bible that belonged to my Wheaton family (who lived in Minneapolis from about 1873 forward). By the time I saw the post, 5 years had passed and – though I wrote inquiring about it – the person who had the Bible did not reply. Any ideas? The Minnesota Historical Society (www.mnhs.org) has in its manuscript collection the family papers of Herbert E. Wheaton and Charles Augustus Wheaton as well as some wonderful photographs. It may be worthwhile to inquire if a Wheaton family bible was donated to the society in recent years. Thanks for the tip Alane. This is probably not the right Wheaton family but I hope they might have something on the family of George Wheaton or son George A. Wheaton. I am aware that they have my great-grandfather’s (GAW) Civil War letters transcriptions. You’re very welcome Janice. Are you familiar with the Minneapolis neighborhood where your ancestor, George A. Wheaton lived? Please contact me at elmoreroundtree@aol.com and I would be happy to share additional information with you! Great story Patty! What a treasure you have there. So what are your long term plans for these Bibles? A lot of us would like some guidance on that aspect of being the family keeper of the Bibles. I have a provision in my will regarding the bibles. Not everyone in the family is interested in them, but some definitely are so I wanted to make sure there’s not a dispute as to where they should go. Patty, who was the book restorer that you used? I used Leonard’s Book Restoration in Burrows, IN. They were wonderful to deal with, and provided an estimate when I emailed photos of the bibles. for that question and answer. There are a few (hundred) of us who would like to do the same thing. #1 – Do not automatically leave them to the oldest child. Leave them to the one who cares the most. Have the Bibles restored (as you did) and learn how to store them properly. Your local history museum can likely provide advice or help you locate a preservation specialist. to educate you on how to store items properly. Scan you photographs and store them, as well as the original prints, and negatives if you have them, properly. Again, local museum or a good photography business will usually be able to provide advice on proper storage. For photos, store copies in several different places (three is often recommended). Pay attention to light and heat and humidity requirements. Educate yourself about proper preservation and storage requirements for different types of family treasures. Been there and done that, and am still learning new stuff whenever I can. Thank you for sharing this story. I have learned to look inside every old book (or envelope) for clues to my ancestors and am often rewarded. Sort of “off topic” but maybe someone can help. My uncle owned our family Bible and way back in the 1960’s I had copies made. I was a little naive then and did not realize the importance of title pages. This Bible was later lost. I also found breakthrough Bible records through the DAR library. These were “loose pages” also without a title page. So far these records have helped me join DAR and Colonial Dames of the XVII Century. I also have an application in for the Mayflower but the lack of title pages seems to be a problem. Now, as a retired librarian, I am well aware of the importance of title pages and can tell by the typography of the copied pages that one Bible is post Civil War and 19th century and the other is pre Civil War. It seems that these Bibles were probably massed produced and I should be able to figure this out. Any suggestions? Thanks! I have two old Bibles, which makes sense as my gg grandfather was a Methodist minister (and missionary), then a Baptist minister, and finally a Christian (Disciples of Christ) minister. He was born in 1808 near Schenectady, NY, into a Dutch Reform family. I have a New Testament, in Dutch, that belonged to his mother, printed in Amsterdam in 1743. It was already an heirloom when she was born in 1781. Her name isn’t in it, but the list of her children is, including one born out of wedlock when she was 17. I’d love to know that story! Of the 8 children born to her marriage, she was lucky to lose only one as a stillbirth, which affected her greatly. In the 1980s my father copied the relevant pages, and I’m so grateful. Now it’s not legible, though a restorer might be able to do something with it. He remarried a year later, and used the Bible to record not just the first marriage and the details of the birth and death of their son. His six children, of whom four survived, their marriages, and the birth of the first grandchildren, are also recorded there. This Bible is in wonderful shape, and several people used it to record at least one person per generation, down to my grandfather. My gg grandfather also used the many blank pages to write notes on Revelations, in both black and red ink, in Hebrew, Greek, and Latin. I don’t know where he got his education. Years later I learned that he wrote a scholarly book, which is in the Library of Congress. They don’t usually loan those out, but I was able to borrow it through InterLibrary Loan. It was on Revelations. Kind of a slog to read, but it taught me a lot about his theology and who he was. I am the keeper of a Whitmore family Bible where there are birth dates listed for several children, but it was no help for great-grandpa. In other records, I have found two different years stated for his birth. (I think he may have lied about his age to enlist during the Civil War.) In this Bible record it says “William Tryon Whitmore was born …” and it’s blank! Thanks a lot great-great-grandma! For years the Bible was placed vertically on a shelf, and pages became loose as the binding threads deteriorated. A monastery in Oregon has a shop that repairs books and they did a great job for an affordable price. To preserve it, I now shelve it and other old volumes lying horizontally on their backs. Hi Linda, mygggrandmother was Florence Caroline Whitmore. Are any of yours from Conneaut, Ohio, or Kenosha, Wis.? About all we have of her is her opera glasses. She was, in her time, a well-known harp player in Boston. She was married to Eben Enos Sherwood (divorced) and James Hall, Jr. I wish I could say I know of your Whitmore ancestor, but unfortunately I don’t. We have some rather distant relations (one noted as the son of a fourth great grandfather) in Ohio and Wisconsin. My records of our Whitmore line go back to the 1630s in Massachusetts and Connecticut, where they stayed for generations before migrating West. Maybe if you have names further in the past, we could find a connection. Florence’s father was Dr. Levi Whitmore, his father Abijah Whitmore, his father John Whitmore…back to Royalston, Worcester, Mass. Are we kin? Hmm, there definitely is a possibility of relationship. Whitmore is my husband’s line. His 7th great-grandfather, Francis b. 1650 in Cambridge, Mass. ; moved in 1672 and was an early settler of Middletown, Ct. where his descendants remained for generations. But Francis’ father, also named Francis, stayed in Massachusetts, as did all six of his other children. One of these is named John, born in 1654 in Cambridge. Actually, I have 24 Johns from the 1600s to the early 1800s. Most posted trees I’ve seen list the first Francis’s father as John b. 1589 in England; I suspect this is true but haven’t found documentation. Many of this Francis’ descendants named their sons John. I might find Abijah if I knew which John, by his birth date, was his father. I haven’t traced all the “cousins” all the way down from the top. So far I’ve failed to find the information needed to donate it to a family member or appropriate location. If anyone has any ideas, please let me know! I have a provision in my will regarding the bibles, so there’s no question where I want them to go. You can donate the bibles to NEHGS, but during a research program there I learned that they don’t keep the entire bible, only the pages with recorded family information. It’s a good option if you don’t have anyone who wants the bibles but you want to preserve the information for future researchers. You may well have already found this information, but a quick search I did shows a William English (born in Ireland) who married Sarah Cathcart in Pennsylvania; their first child was born in Oct 1870 and census records list their marriage at about 1870, so this could very well be your family. Their children all seem to have been born, and continued to reside, in Chester County, Pennsylvania. There are some public family trees tracing back to William and Sarah, so it’s likely that someone out there would love your family Bible pages…assuming it’s the correct couple! Their children and approximate birth years were Annie 1870, Sarah “Sadie” 1872, William 1874, Emma 1875, Allen 1877, Mary “Mae” 1881, and Jennie 1885. If those names match up with the other pages you have, then I think we have a match. If you can’t track down any family members, perhaps a Chester County historical group or library would like your Bible.